After 12 regular-season games in which Ohio State didn't always look like a championship-caliber team, Saturday night's Big Ten title game against Northwestern was more of the same. Despite coming off their biggest win of the season a week prior, the Buckeyes didn't appear to take 'the next step' and shore up the issues that had plagued them all season. Not only did Ohio State continue an ugly trend by committing nine penalties for the seventh time this year, but its defense also gave up 418 yards to the nation's 105th-best offense, the third-highest total surrendered to the Wildcats all season. 18% of those yards came on one play, a 77-yard first quarter touchdown run by John Moten IV, which marked the 6th time an opposing runner had broken a rush of 60 yards or more against the Buckeyes this fall. Only 2-10 Georgia State has given up more such plays. On the offensive side of the ball, OSU continued to struggle in their attempts to run the ball, picking up only 108 yards on the ground despite 46 attempts. As usual, that left the pressure to fall squarely on the shoulders of Dwayne Haskins and the passing game, resulting in 41 passes from the Heisman candidate that evening. Of course, Haskins passed what may be his penultimate test in Scarlet and Gray with flying colors, breaking his own school record for yardage in a single game with 499 to go along with 5 touchdown tosses. But while the numbers may show that the redshirt sophomore is just picking up where he left off after a 396-yard performance against the Wolverines, the manner in which the star quarterback propelled his offense was quite different this time around. Unlike the aggressive Michigan defense which was exposed in its efforts to keep up with Haskins' explosive receivers while relying heavily on man-coverage, the Wildcats took the opposite tack. Pat Fitzgerald's disciplined unit seemed intent on playing a cushioned zone scheme that kept the Buckeyes in front of them, forcing the offense to string together long drives in order to score. While Ohio State has been known more for creating big plays through the air this season, the offense in Columbus has quietly been one of the most efficient on third downs, converting 48.17% of the time, which translates to the 11th-best such rate in the nation. Against Northwestern, they were even better, turning 10 of 18 third downs into firsts. Unlike past iterations of Urban Meyer's offense that sought such efficiency by creating short third-down opportunities that could easily be converted on the ground, this year's version found a number of ways to do so through the air. It certainly helps when a big quarterback appears comfortable in the pocket and is able to scramble out of arm tackles while keeping his eyes downfield. But though Haskins has completed 41 passes that gained 25 yards or more this season, the Buckeyes don't typically take all that many deep shots downfield, relying more on quick distribution to athletes like Parris Campbell who pick up yards after the catch. However, with the Wildcats blanketing the secondary with as many as eight zone defenders, Haskins had to uncork a few deep balls. On a long, 3rd-and-20 late in the first half, Northwestern only rushed three defenders in front of a conservative, four-deep Quarters scheme. With three receivers to the field and only Terry McLaurin lined up to the boundary, the receiver's outside release effectively turned the cornerback's deep zone into a one-on-one matchup down the sideline. Without any disruption at the line of scrimmage, the veteran receiver was able to blow right by the defender as he attempted to flip his hips in time. After stepping up in a clean pocket, Haskins dropped a beautiful deep ball that hit McLaurin in stride. Haskins was on-target all night with such downfield attempts, completing 7-of-9 attempts of 20 yards or more, with four touchdowns. But while those deep balls populate highlight videos, it was Haskins' short gains on third down that defined the game. The former child prodigy cemented his status as the greatest passer in school history with an astonishing performance on third downs in the Big Ten championship, completing 13-of-14 passes for 176 yards and two touchdowns. Not every completion made it past the sticks and resulted in a fresh set of downs, but Haskins' mastery of what is typically the most difficult scenario for a quarterback showed immense growth in a short period of time. After some initial success early in the season against lesser opponents like Oregon State and Rutgers, Haskins and his teammates struggled to convert on third down, highlighted by a 4-of-17 performance in the close win over Penn State. In the past three games, however, the Buckeyes have been outstanding, moving the sticks in 24-of-44 chances. While the Wildcats aren't known to be particularly ferocious in this regard, ranking 43rd nationally in opponent's third-down conversion rate, the Buckeyes seemed to have multiple plans ready to attack their zone defense. With cornerbacks often bailing to cover a deep 1/3 zone, the flats were left exposed and let Haskins show off his accuracy while on the move, hitting Dixon early on a speed-out pattern before the defender could break back on the route. Haskins continually attacked the flats with timing patterns throughout the evening. One snap before J.K. Dobbins' 2-yard touchdown run in the first quarter, the Buckeyes had to convert a 3rd-and-5 from just inside the 20-yard line. With the Wildcats secondary retreating in their 3-deep zone, the curl/flat zone defender was forced to choose between covering the nearby Parris Campbell in the slot, or outside receiver Binjimen Victor as all four Buckeye targets ran 8-yard curl routes, each breaking inwards after five steps. Haskins could simply read that zone defender and sling an easy pass to the wide-open Victor for 17 yards. Short curls and hitch patterns were a staple of the Buckeye passing attack all night, with Haskins often reading a single, zone-dropping defender to make his read. 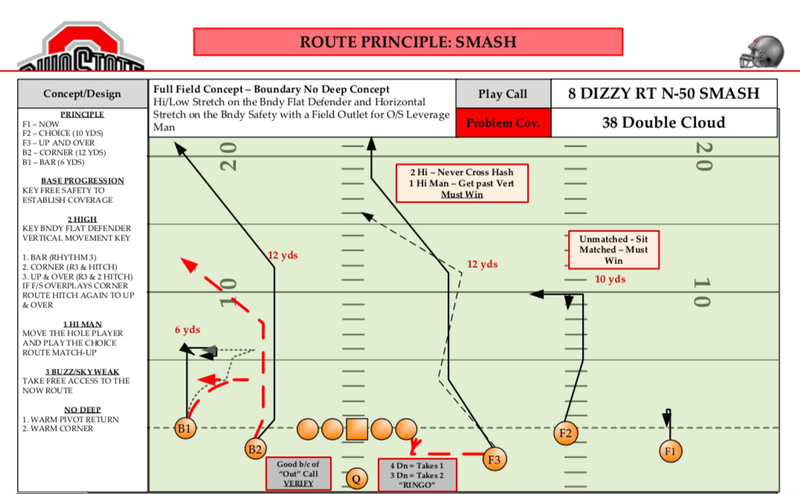 Though not seen as often today with the prevalence of pattern-match coverages that blanket receivers instead of covering specific areas, Smash has long been a common method for attacking zone defenses. In the simple, two-man concept, the inside receiver runs a corner route while the outside man runs a short, 6-yard hitch. 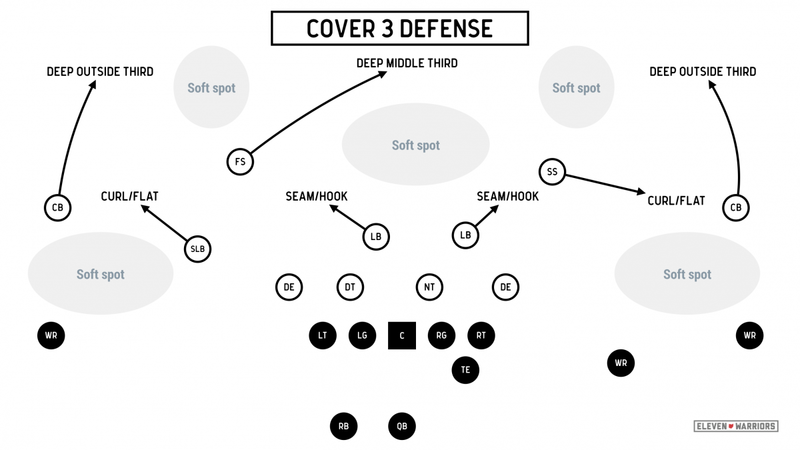 Against 2-deep zones, the cornerback will jump the hitch and leaving the corner route open as safeties can rarely make up the ground needed to break on the ball in their deep-half zone. With the Wildcat cornerbacks bailing into deep-thirds on nearly every play, the underneath hitch was the route left open. The OSU passing game was incredibly effective, not just with the deep balls that found the end zone, but with a methodical attack that picked apart a conservative defense hell-bent on making its opponent put together long drives. But the Buckeyes weren't just successful when they had the ball on third downs. While Greg Schiano's defense has struggled against spread offenses this fall, particularly when asked to stop the run against three and four-receiver sets, the unit has quietly been one of the nation's best at getting off the field on third downs. Ohio State's opponents have only converted 31.35% of their third-down tries this fall, which is also the 11th-best rate in the nation and comparable to big-name defenses like Clemson (27.88%), Alabama (30.93%), and Michigan (32.08%). As they showed the week before, the Buckeye front-seven is happy to play against heavy personnel groupings with multiple tight ends. On the Wildcats' first drive of the game, they came up short on 3rd-and-1 after Robert Landers and the interior OSU defensive line simply submarined the Northwestern blocking scheme and stuffed running back Isaiah Bowser for no gain. After that, the Wildcats would essentially abandon their three-tight end sets and look to only run from the shotgun. While that did lead to a 77-yard touchdown run from John Moten IV on their subsequent possession, it was the only time Northwestern found any real success on the ground that evening. Bowser would only pick up 62 rushing yards on 13 carries, struggling to find any seams after Moten's long run. While Landers and Dre'Mont Jones led the charge from their defensive tackle spots, the Buckeye depth up front showed, with sophomore Haskell Garrett and freshman Tommy Togiai stuffing a late third down outside zone run for a loss. Of course, the stars of the Buckeye defensive line played one of their best games of the season in the conference championship. Jones recorded four tackles and a sack in what may be one of his final games in an Ohio State uniform, but the star of the show was sophomore Chase Young. Much of the discussion following the game was around the loss of Nick Bosa after the third game of the season, and what that meant for the team's playoff resume. However, for those watching this game, it was easy to forget about #97 as all eyes were on #2. Young was nearly unblockable all night, registering six QB pressures (according to Pro Football Focus) while tallying three sacks, a forced interception, and a forced fumble. The fumble proved to be a crucial moment in the game, as Young hit quarterback Clayton Thorson's arm before he could throw, giving the ball back to Haskins and the dangerous offense with great field position. While the Buckeyes kept drives alive all night by converting 55% of their third down opportunities, the Wildcats were only able to move the chains on 5 of 15 attempts. Though Ohio State had been inconsistent in a number of areas throughout the 2018 campaign, finding success on the most important down was an area in which the team consistently lived up up to expectations.